A bridge is used to replace a missing tooth (or several teeth) by joining an artificial tooth permanently to crowns on adjacent teeth or dental implants. It is the most common procedure followed for replacing teeth. No. Usually, a local anaesthetic is used and it should feel no different to having an ordinary filling done. If the tooth already is root canal treated there is no need of even a local anaesthetic. It is important to keep the bridge just as clean as you would your natural teeth. The bridge itself cannot decay, but decay can start where the edge of the crown joins the tooth. Brush last thing at night and at least one other time during the day with a fluoride toothpaste, and clean in between your teeth with ‘interdental’ brushes or floss. Will the Bridge feel different? Because the shape of the bridge will be slightly different from the shape of your tooth before it was crowned, you may be aware of it at first. Within a few days it should feel fine, and you will not notice it. The bridge may need some adjustment if your bite does not feel comfortable, and if this is the case, you should ask your dentist to check and adjust it. When you and your dentist are happy with the fit and appearance of the new bridge, it will be fixed in place with special dental cement or adhesive. The cement forms a seal to hold the bridge in place. The bridge will be made to match your other teeth as closely as possible. The shade of the surrounding teeth will be recorded, to make sure that the colour looks natural and matches those teeth. How long do Bridge last? 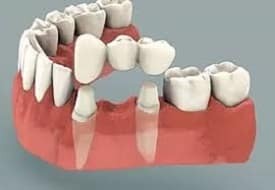 How long a bridge lasts can depend a lot on where it is in your mouth, type of material, the height and structure of the tooth and the number of teeth taken for support. Your dentist can tell you about how long your bridge should last and wherever necessary Crown lengthening procedure may be advised to enhance the structural support for the crown of the bridge. Are there different varieties in the Bridge? Yes. There are different types of bridge available. Your dentist will guide you as to which one suits best for your tooth. Usually Zirconium Bridge is the best bridge in terms of both strength and aesthetics.